It was one year ago - August 29, 2005 - that Hurricane Katrina, one of the worst natural disasters ever to hit the United States of America, came ashore. Over 1,800 people were killed in Louisiana and Mississippi, 80 percent of New Orleans was flooded, and hundreds of thousands were uprooted to shelters and temporary homes all over the United States. Katrina grazed Florida before making landfall at 6:10 a.m. on Aug. 29, 2005, in Buras, a tiny fishing town 65 miles south of New Orleans on one of the fingers of land jutting out into the Gulf of Mexico. Entire blocks of houses, bars and shops vanished, whipped into the Gulf by a wall of water 21 feet high. The category 4 storm then roared into the Big Easy and Mississippi, and things began to look better in New Orleans as the sun came out and winds subsided. But it was only a calm before the deluge – as the levees broke and America saw catastrophe on a scale previously unimagined. President Bush and other officials are in the Gulf Coast for anniversary ceremonies and assessments of progress in rebuilding. "My message to the people down here is that we understand there's more work to be done," Mr. Bush said Monday night at dinner with Louisiana Gov. Kathleen Blanco and New Orleans Mayor Ray Nagin, pledging continued government assistance with the recovery. "The federal government will remember the people... this is an anniversary but it doesn't mean its the end." Mr. Bush – who visited Biloxi, Miss., Monday – will begin Tuesday at breakfast with New Orleans Mayor Ray Nagin, followed by a prayer service at St. Louis Cathedral, a triple-spired church left virtually untouched by the fierce winds and high waters that hit the city Aug. 29, 2005. The church stands in Jackson Square, in the heart of the French Quarter, where President Bush last year acknowledged that his administration had failed to respond adequately to the hurricane. The White House is hoping that if the Gulf Coast shows signs of renewal, that mark on the Bush presidency will be erased. "Money is beginning to go out the door so people can rebuild their lives," President Bush said Monday in Biloxi, talking about rebuilding efforts in that state. "In Louisiana, it's been a little slower." 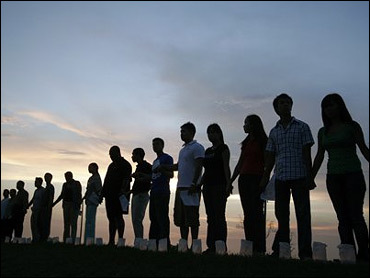 In New Orleans Tuesday, residents are holding vigils in memory of the dead and ringing bells to mark the moment one of the city's flood walls breached and water engulfed the northern edges of the city. Wreathes will be laid on the site of each successive levee break, dotting the city with bouquets in a commemoration of the flood. In one of the Crescent City's age-old traditions, a jazz funeral will wind through downtown streets, beginning with a somber dirge and ending with a song of joy. At New Orleans convention center, where for days haggard refugees waited in vain for food, medical assistance and buses, President Bush will join an ecumenical prayer service. Others plan to mark the occasion privately at home with their own prayers - including personal calls for protection. "I'm going to pray to the good Lord that he put his arms around the levees. I'm praying that he hug the levees tight so they don't break again, that he keep us safe," said 58-year-old Doretha Kitchens, whose home in the Lower Ninth Ward was submerged under a 10-foot wave. Throughout New Orleans, trailers still line driveways in neighborhoods where debris is stacked up in piles and unchecked weeds have overtaken abandoned houses. Only half the population has returned. Emergency medical care is doled out in an abandoned department store, while six of New Orleans' nine hospitals remain closed. Only 54 of 128 public schools are expected to open this fall. The one-year mark is a reminder of how much needs to be done - and of how far each survivor has come. "Only when it's dark can you see the stars," said the Rev. Alex Bellow, at a gathering outside a school in the Lower Ninth Ward. "So when they tell you, 'You're not going to make it,' you keep looking up." President Bush has pledged to talk with officials in New Orleans about what can be done to expedite rebuilding plans. "My message to the people down here is that we understand there's more work to be done, and just because a year has passed, the federal government will remember the people," Bush said in Biloxi. "This is an anniversary, but it doesn't mean it ends. It's the beginning of what is going to be a long recovery, but I'm amazed by the opportunity. I'm amazed by the hope that I feel down here." In New Orleans' Jackson Square last year, Mr. Bush offered three proposals to help fight poverty. One idea was carried out. The Gulf Opportunity Zone is giving $8.7 billion in tax breaks to developers of low-income housing, small businesses and individuals. But worker recovery accounts, which were meant to help victims find work by paying for school, job training and child care, didn't materialize. And neither did the Urban Homesteading Act that would give poor people sites to build homes that they would finance themselves or get through programs like Habitat for Humanity. Only 50 percent of New Orleans has electricity. Half its hospitals remain closed. Violent crime is up. Less than half of the pre-storm population of 455,000 people has returned. Tens of thousands of families still live in trailers and mobile homes with no real timetable for moving to more permanent housing. Insurance settlements are mired in red tape. The city still has no master rebuilding plan. And while much debris has been cleared, some remains as if the clock stopped when the storm struck. The president is stressing that the states and local governments need to do their part to get federal money to victims. That message apparently is aimed at leaders in Louisiana and New Orleans, where federal money for citizens to rebuild homes has not yet begun flowing. In Mississippi, Bush expressed hope that the $110 billion would be enough. "Hopefully that'll work," he said. "Hopefully that's enough." Democratic members of the House Committee on Homeland Security released a report Monday recapping reports of allegedly wasteful recovery contracts by the Federal Emergency Management Agency and accusing the administration of an "approach to governance that was content to allow FEMA's crucial procurement office to operate at just a fraction of its necessary staffing level." House Democrats, a dozen of whom toured Mississippi and Louisiana on Monday, plan a Wednesday announcement of their own recovery plan for the region. "I think the American public is going to be very, very surprised to know this recovery is way, way behind what their expectations would have been," Rep. James Clyburn, D-S.C., adding that people in the city have "been living a real hell." "It's hard to believe this is the United States," said Rep. Elijah Cummings, D-Md. Clyburn and Rep. Adam Schiff, D-Calif., mentioned possible insurance reform to allow for what Schiff called "mega-catastrophes." At the rate the recovery is going, Schiff said, he expects it will be a decade before some hurricane-affected communities come back. The U.S. Army Corps of Engineers has repaired and reinforced 220 miles of levee walls. "I believe that the levees are ready for hurricane season," says Don Powell, the Bush administration's coordinator of the Gulf Coast rebuilding effort. "The levees are back to where they were pre-Katrina, and they're on their way to being the best — better and stronger — than they have ever been." It's estimated that only half of New Orleans' 2,300 doctors have returned since the storm — and there are even fewer nurses. "It's full out, emergency medicine, sick people and lots of 'em, all day long," emergency services specialist Dr. Tracy Legros . A survey suggests that the traumatized survivors of Hurricane Katrina forged a surprisingly powerful inner strength that steeled them against suicidal despair. The study is the most elaborate post-storm survey yet. It shows that while the survivors suffered twice as much mental illness as the pre-storm population, they contemplated suicide far less often than mentally ill people surveyed before Katrina. An unemployed man admitted Monday that he submitted more than 50 false applications for government aid following Hurricane Katrina and collected more than $76,000 in disaster relief checks. Jeffrey Rothschild, 59, pleaded guilty in federal court to mail fraud, bank fraud and money laundering. Ticket sales have been far from spectacular, but Ivan Neville says performing at the same Hurricane Katrina anniversary concert Tuesday night as Stevie Wonder is going to be incredible no matter how many people are there. "What an honor," said the New Orleans keyboardist and singer, and son of Neville Brothers singer Aaron Neville.